Position racks in the upper and lower thirds of the oven and preheat to 375°. Line 2 large rimmed baking sheets with foil. Divide the eggplant between the prepared baking sheets and toss each sheet with 2 tablespoons of the olive oil. Season with salt and black pepper and spread out in a single layer. Bake for 45 minutes, until golden brown; rotate the baking sheets halfway through baking. Keep the oven on. Meanwhile, heat 1/4 cup of the olive oil in a large enameled cast-iron casserole. Add the onion, season with salt and cook over moderately low heat, stirring occasionally, until softened, 8 minutes. Add the garlic, crushed red pepper and 5 of the basil leaves and cook, stirring, until the garlic is softened and fragrant, 1 minute. Add the tomatoes and simmer, stirring occasionally, until the sauce is thickened, about 45 minutes. Let cool slightly, then transfer to a food processor and pulse until almost smooth; season with salt. You should have about 6 cups of tomato sauce. Spread 1 cup of the sauce in the bottom of a 2 1/2-quart shallow baking dish. Top with half of the eggplant and the remaining basil leaves. Drizzle with 1 tablespoon of the olive oil. Spread 2 cups of the sauce on top and sprinkle with half of each cheese. Drizzle with 1 tablespoon of the olive oil. Top with the remaining eggplant, sauce, scamorza and 1 tablespoon of olive oil. Bake the gratin in the upper third of the oven for about 30 minutes, until bubbling. Remove from the oven and preheat the broiler to high. Sprinkle the remaining 1/2 cup of Parmesan over the top and broil for 3 minutes, until golden brown. Let cool for 10 minutes before serving. The gratin can be assembled through Step 3 and refrigerated overnight. Bring to room temperature before baking. Review Body: Excellent recipe. 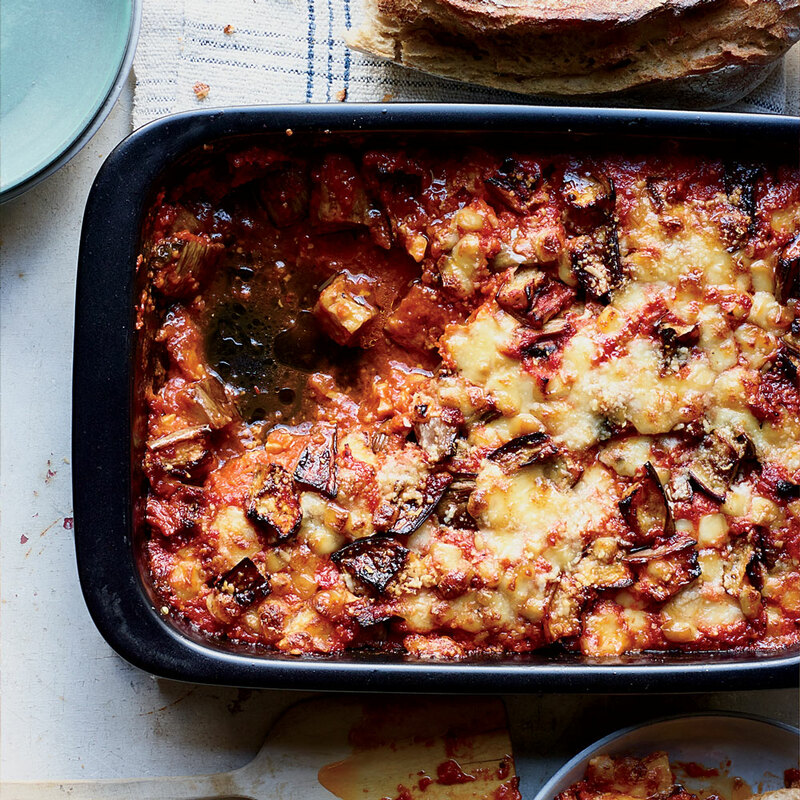 We like this better than eggplant parmesan. Didn't miss the pasta at all. Review Body: I'm not a huge fan of eggplant, especially the texture after being baked. However, this recipe hit it out-of-the-park. The eggplant had the right amount of toothiness. So good! Review Body: This is an amazing recipe. I don't really like eggplant but this was something else. Awesome flavors.